Fig. 1: Aerial view of the ancient Kourion area, showing also the submerged construction. 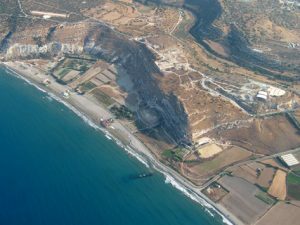 Beginning in the summer of 2003, investigations were carried out at several locations in Episkopi Bay near the ancient Greco-Roman site of Kourion. A construction extending beneath the water over 100 m from shore just under the city of Kourion was preliminarily mapped (Fig. 1). Regularly 4 m wide (though by no means uniform as the state of preservation is quite poor), the structure was reported and studied some years back (by both F. Haggerty and J.R. Leonard; see Leonard 1995; Christou 1997), and almost certainly represents all that remains presently visible of the ancient harbor of known to have been located at Kourion. 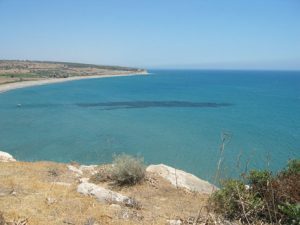 Additional investigations were undertaken in the shallow areas offshore from the cliffs directly west of Kourion, as well as around the mouth of the Kouris River, though in each instance little cultural material was found. R/V Hercules, the vessel undertaking remote sensing work in Episkopi Bay, courtesy of RPM Nautical Foundation. 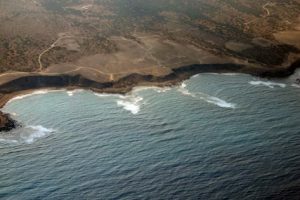 It seems likely that the lack of visible remains is due at least in part to more recent deposition of silt, either from longshore drift and the cliffs above, or else, in the case of the Kouris mouth, from the river itself. 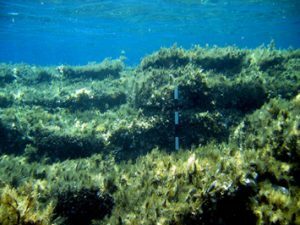 In summer 2005, a campaign of remote sensing survey began in the deeper waters (up to nearly 100 m deep) of Episkopi Bay (Fig. 2). Over the course of 15 days, an area of over 45 square kilometers was mapped utilizing multibeam sonar from RPM Nautical Foundation’s research vessel Hercules, resulting in the location of a number of potential sites of interest. Utilizing divers for the shallower areas and a small remotely operated vehicle (ROV) for the deeper work, each of the most promising targets was explored and photographed non-intrusively during the following summer (Fig. 3). Although these targets were confirmed as simple geological features—in one case, though, a significant scatter of pottery does indicate some cultural activity, but probably not enough to indicate a complete wreck—the observations have intriguing implications for archaeological site formation and sedimentation processes near the Kouris River mouth. 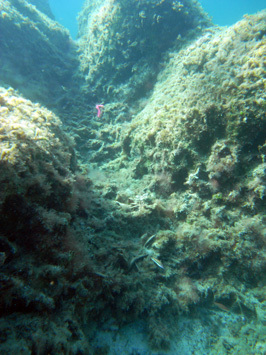 Submerged structure toward the center of Avdimou Bay. Toward the western edge of Episkopi Bay, semi-protected conditions in Avdimou Bay suggested the possibility of an ancient shelter for mariners. At the center of the bay can be found a long, wide structure probably intended to augment the bay’s natural shelter from predominant westerly winds (Fig. 1). A preliminary map of its shape and orientation was made, showing that the structure, now completely submerged, extends approximately 140 in length. No features give clues as to its construction or date, and a general lack of pottery in the area similarly allows no suggestion of when it may have been created (perhaps even in more recent times). It should be noted, however, that ancient pottery onshore, including fragments of Late Roman amphoras, may indicate early commercial activity at the inlet. The work of Tønnes Bekker-Nielsen (2004) has revealed traces of a small Roman road branching off the Kourion-Paphos route toward the inlet at Avdimou Bay. 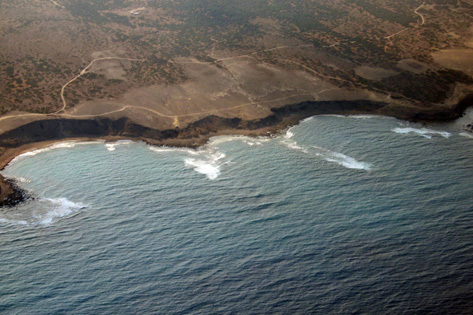 Aerial view of the inlets along the west coast of the Akrotiri Peninsula near its southern tip. 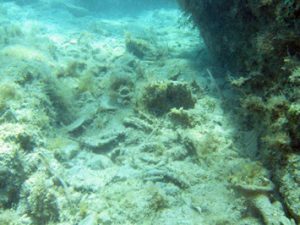 A series of investigations was carried out over the course of three seasons at several sites around the west and south of the Akrotiri Peninsula, to the east of Episkopi Bay. Diving survey in the small bays along the south edge of the Akrotiri Peninsula’s west coast revealed significant concentrations of ceramics that may point to this area’s use as a makeshift anchorage during certain times in antiquity. Although these bays open directly to the west, the predominant direction from which the winds come, the bays’ proximity to a settlement not far inland atop the cliffs at Katalymata ton Plakoton may have provided a useful location for loading and offloading cargo (Fig. 1). 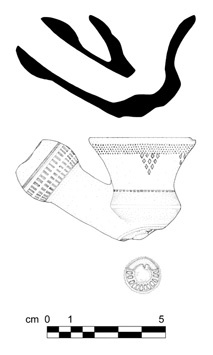 A clay smoking pipe recovered from the inlets (drawing: T. Nowak). Even so, no anchors were found mixed among the broken and scattered ceramic sherds near shore. Finds here included a few traces of Hellenistic ceramics mixed among significantly greater concentrations of Late Roman amphoras, particularly LR1 jars of different dates and several variants. Attestation for the area’s later use is limited to a few clay smoking pipes recovered from the shallows, which seem more likely to have been dropped from shore (Fig. 2). 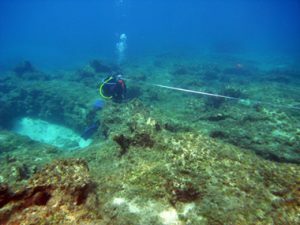 Just north of Cape Zevgari, at the southwest tip of the Akrotiri Peninsula, the smashed remains of a possible shipwreck carrying a cargo in amphoras of Hellenistic Rhodian type were graciously shown to the team by local archaeologists. 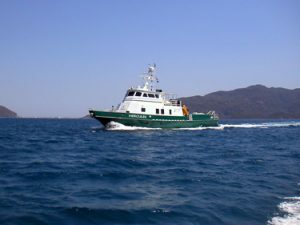 The low-lying headland of Cape Zevgari was itself the subject of investigations between 2003 and 2005. Here, several dangerous rocks and a long reef create a prominent navigational hazard for mariners rounding the cape too closely. The survey revealed a surprising range of ceramics and other finds indicative of two and a half millennia of intensive maritime commerce. Again, the extensive remains were dominated by ceramics, with the earliest dating probably to the late Archaic or Classical period: a small group of fragmentary basket-handle amphoras. Other ceramic remains included typical amphoras of Hellenistic Rhodian type, as well as late Hellenistic and early Roman pseudo-Koan varieties. Several huge coarse fragments of a dolium (pithos), as well as several partially intact cooking vessels were also recorded here but are difficult to date without context. 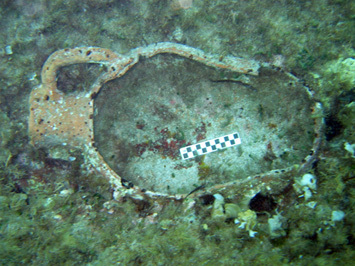 One of the better preserved LR1 amphoras from the wreck near Cape Zevgari. Scattered atop a raised ledge of approximately 35 by 15 meters, only five to seven meters below the surface, was perhaps the most important assemblage from the area: a cargo of a Late Roman vessel that may have foundered on the dangerous shoals near this stormy cape during the 5th or 6th century. Over 150 mostly or fully intact LR1 amphora necks were recorded on the surface (Fig. 4), suggesting that, if complete, this assemblage would likely represent the cargo of a rather small merchant craft (Leidwanger 2007). Further east, brief investigations were carried out in the shallow waters off Akrotiri’s south coast at the site of the Hellenistic-Roman port known locally as “Dreamer’s Bay”. The site, which is now under full exploration by an international team (“Akrotiri-Dreamer’s Bay Ancient Port Project”), revealed a group of eight or nine stone anchors and a number of pottery concentrations, especially of Late Roman transport ceramics (Leidwanger 2005). 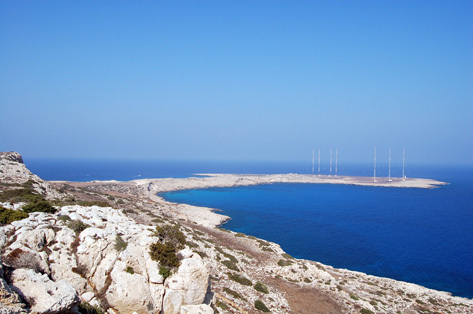 The low headland of Cape Greco, viewed from the high plateau farther west. 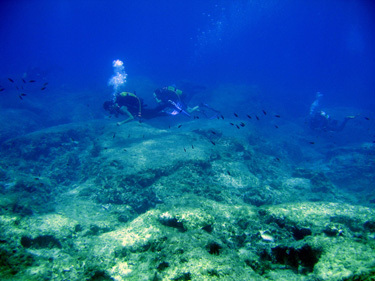 Diving and remote sensing survey in the area of Cape Greco, around the southeast tip of Cyprus, began as part of the “Eastern Cyprus Maritime Survey” in 2006. The most prominent topographical feature along this stretch of the island’s shore, Cape Greco would have presented both an important landmark and a grave danger for mariners, including not only those engaged in local cabotage but also those heading out to sea or making landfall after crossing from the Levant (Fig. 1). Though backed farther to the west by a high plateau, the cape itself is generally low—only a few meters high—and inconspicuous enough to have posed a particular challenge for sailors unfamiliar with the local coastline or unprepared for the often strong southwesterly winds that drive vessels toward shore. 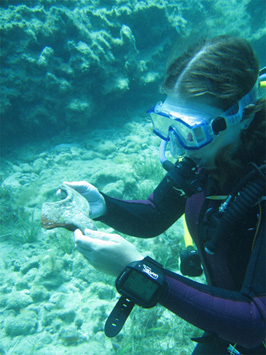 Various finds have been reported in the area by divers over the years, and therefore not surprisingly, the team was quickly able to record ceramics and anchors indicating the use of several anchorages in the area during classical antiquity. A diver records an iron anchor on the seabed near Cape Greco. A total of six stone and metal anchors and a number of ceramic assemblages recorded throughout the area testify to a long history—from antiquity through at least the Medieval period—of merchants stopping at the many natural and manmade ports that dot the shores around and north of Cape Greco. In certain cases, the amphoras and other cultural material provide solid evidence for maritime traffic dating from the Archaic or Classical period. The much greater quantities of Hellenistic through Late Roman pottery, though, probably indicate these centuries as the most commercially prosperous, an observation that is perhaps understandable when one considers that this was the area of ancient Lefkolla (Λευκόλλα), attested in the early Roman era by the geographer Strabo (14.6.3) somewhere along this coast but thus far never positively identified through survey or excavation. Several of the stone and metal anchors recorded in the area come from south of the cape (Fig. 2), where diving survey revealed pottery spanning from perhaps as early as the Classical or Hellenistic period through late antiquity. Teams of divers surveying in the shallow waters of Konnos Bay. The finds were almost certainly accumulated gradually by ships lying at anchor in wait for better winds. 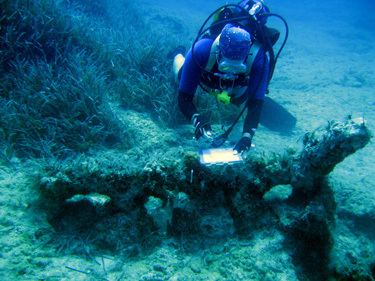 To the north of the cape, teams of diving archaeologists surveyed the seabed around Konnos Bay (Fig. 3), resulting in the discovery of only one small site of concentrated ceramics not far from shore. Though the finds—primarily amphora sherds—are not extensive, they do appear on first observation to date principally to the early Roman era, and so may actually result from a single event, perhaps jettison or dumping of trash (Fig. 4). Small concentrations of pottery came to rest in the shallows of Konnos Bay. Diver raising the top of an amphora (LR4) for more thorough documentation on the surface and re-deposition on the seabed. North of Cape Greco, in the shallow waters near Protaras, archaeologists began investigating the remains at several inlets that may have served as anchorages in antiquity. The area of Green Bay and Decosta Bay, for instance, yielded significant new finds, including a composite anchor, the traces of at least one or two millstones, and many fragments of amphoras, common wares, and roof tiles, particularly LR1 jars of a late variety and LR4 amphoras (Fig. 1), but also at least one fragment of an Archaic or Classical basket-handle jar. Such finds underscore the importance of small opportunistic shelters and anchorages throughout various periods of heavy maritime activity in the island’s history (Leonard 2005). In addition to ceramics and anchors that indicate stops for ancient mariners, a new wreck of the early imperial period was discovered in 2007. The site is badly damaged by wave action and strong currents, but the extent of the scatter and the presence of several interesting amphora types make it worthy of more intensive mapping and study (Figs. 2-3). Diver establishing datum points by which the wreck is mapped.